Well, it’s a race day. Or at least it is up here in Seattle. So I’m going to assume it is for all ya’all, even though that clearly isn’t the case. Sorry! Can’t make these perfect for everybody! I see way, way too many people spending a ridiculous amount of time on their trainers before the race, and frankly, I think a huge number of racers leave their best effort of the day back in the tent on the Gerbil Wheel before the race. I pretty much never warm up for road races, unless I Know the first few K are going to be pedal to the metal. You need to hit that first K, hell that first hundred meters at 100%, with all guns blazing. The study I linked to above basically showed no difference between the results of warm ups conducted at different levels of intensity and duration. The key was simply to warm up, get the legs turning over. Frankly, for Cyclocross, I think you need to warm up pretty hard, if for no other reason than that you don’t want the shock of that F-ing start effort to hit your body (and mind!) like a ton of bricks. OK, so what should your warm up look like? Heck, in a perfect world, you would go ride for an hour in the morning several hours before your race! 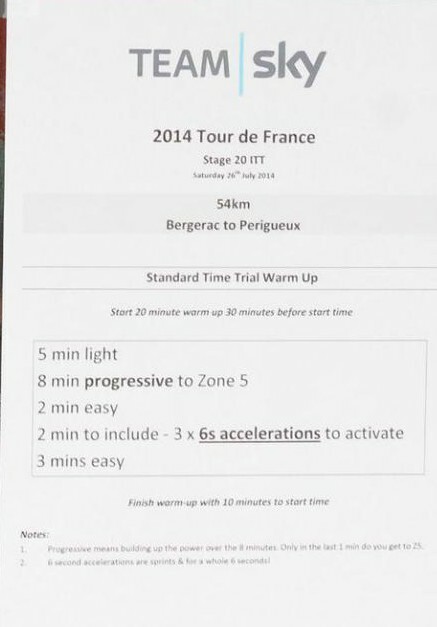 That’s the actual Team Sky Time Trial warmup, photo is of a reminder sheet that was posted on the side of the team bus. …when you have a chance. ~ by crosssports on September 12, 2015.